Press Release : Frankie Valli has had what you might call a varied career: you might know him best for the theme song to Grease and he was last spotted on TV coming to a grisly end as Rusty in the Sopranos. But as well as 'Grease' and 'Oh What A Night', the Italian American crooner has made some storming white soul records that over the last 30 years have been leapt on by the Northern soul and disco undergrounds. 'Beggin' is the track, a tune that, re-edited by Parisian DJ Pilooski on one of his ultra-limited Dirty Edits twelve inches on his own Dark & Lovely label, became a euphoric fusion of emotional Northern soul stomper and end-of-the-night, hands-in-the-air rave moment. 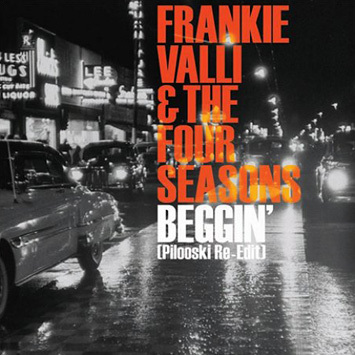 Note CD-Single features two versions of 'Beggin'': Pilooski Re-Edit Radio Version and Original Version.